A1 Intraday Tips a Best Intraday tips provider has explained how to make money in bearish market by Short selling in nse market. Short selling is the selling of the stocks or shares that the seller doesn't own in his demat account. A short sale is the sale of a stock that is not owned by the seller, but lended by the broker or any other brokerage firm on a promised to delivered the stock back to the broker. The shares are sold and the proceeds are credited to your account. You have to close this position by the day end if you have short sell in equity segment or before expiry if you have short sell in f&o segment. Suppose If the price drops of the stock that you have short, you can buy back the stock at the lower price and make a profit. But If the price of the stock rises, you have to buy it back at the higher price, and you will be in Loss for the said trade. Short selling refers to selling of stocks which he predicts to fall in some time or in near future. In short, selling, the trader borrows some stock from the broker and sells it. When the price of the stock falls further, he buys it at a lower price, making a profit. The shares are then returned to the broker in nse market. A1 Intraday Tips has explained below the meaning of short selling in nse share market. It has also given brief details about when you can short sell and also information about how to short sells stocks in nse market to make money. Our Indian Stock Market is Highly dependent on the Asian market condition which in turn is influenced by the European market / USA markets. Though there is no rule which says this, but it seems so on the face of it. Different types of trading strategies work in different market condition. In a bearish market, when the stock prices are decreasing, one can still make profits. Short selling is the term given to such trading technique. Generally traders earn money by short selling in share market. Most of the New and Upcoming traders don’t do Short selling of Shares, because of lack of Knowledge. We want traders to earn in both the market trends i.e bullish trend as well as bearish trend. A1 Intraday Tips has given below information about short-selling with the real trading example of short selling in share market. We have given below a live trading example of Intraday Trader Mr. Deepak Shah so that you get the full knowledge about Short Selling in Market. Eg. Mr. Deepak Shah a trader in a share market trades everyday in share market. He holds a trading account in India bulls trading company. He has capital of Rs. 1,50,000 which is in cash in his trading account. Now using his 5 times exposure he can buy or short sell the stock worth 1,50,000 x 5 = 7,50,000. Market opens with a gap down opening due to some global reasons. Mr. Deepak Shah thinks that market is in bearish trend and hopes it will go down more. He Sells 250 Share of ICICI BANK @ 1650, thinking that Icici bank will go down more. Here Mr. Deepak doesn’t hold the Icici bank in his demat account, still he has short sell the stock. As per Deepak view, market tanks more down and so is the Icici bank stock. Mr. Deepak Shah Buys 250 Shares of Icici bank @ 1625 for a profit of 25 Rs on each share. Mr. Deepak Shah has traded in the bearish market and has made money a profit of Rs 6250. He has to pay a small amount of brokerage and taxes to the government from this profit. How to beat the blues of bearish and gap down market? A bearish market indicates a fall in the price of industry's stock prices and an overall dip in broad market indices like nifty and Sensex. Such a market is characterized by a pessimistic attitude of buyers as the stock prices continue to crash. A dip of 20% and more in most of the indices like nifty and Sensex marks the entry into bearish market. Making exceptional profit during this condition is impossible except for short sellers. A short seller can turn the situation to his advantage by borrowing a stock from the broker which is likely to decline further and sell it. When the price of the stock declines further, the trader buys those stocks at the reduced price, thereby making a profit. The stocks can then be returned to the broker. The main reasons for short selling are to speculate or to hedge. Traders borrows shares from one party, sells them to third parties and eventually make profit/loss from the difference in amount between those parties. Short selling is very risky an its involves rented money. Short selling adds to the market volume in share market, Some People feel this is bad and immoral for the markets. 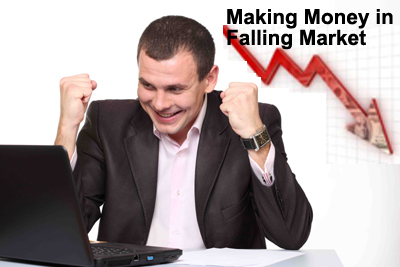 Short selling is a intraday trading technique to make profits even in a slow market. Selling Short is easier said than done as it requires immense experience and ability to predict the market trend and guts to trade. A1 Intraday Tips advises share market traders that When share market is going down and market trend is bearish ( Mandi ) Intraday Stock Traders should not panic should sell the stock and buy later on the same day at low levels to earn in bearish trend. We Provide Short Sell Calls when our Stock tips are sure of the bearish trend in the share market.